Could stars in alternate universes with different physical constants still host potentially habitable planets? What might stars be like in other universes? 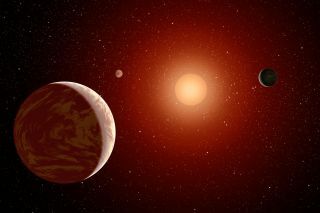 In realms where the force behind radioactive decay is stronger or weaker than in our cosmos, scientists now find that such star systems might often be habitable places for life as we know it. The laws of physics in our universe include a number of fundamental constants, such as the speed of light. However, many scientific models allow for the existence of a vast ensemble of universes called the multiverse, which might include places where the laws of physics differ. "We don't know if other universes exist, and if they do, we almost certainly can't observe them," study lead author Alex Howe, a theoretical astrophysicist at the University of Michigan at Ann Arbor, told Space.com. Still, "by doing this thought experiment, we are helping to answer a fundamental question — did our universe have to be the way it is, or why did it have to be? In doing so, we learn more about our own universe," Howe said. The scientists focused on the weak interaction, also known both as the weak force and the weak nuclear force. This force is responsible for radioactive decay — for example, it causes neutrons to decay into protons, electrons and electrically neutral particles known as electron antineutrinos. One key way the scientists measured habitability was to estimate whether the worlds in these universes could host liquid water on their surfaces. There is life virtually wherever there is liquid water on Earth, so the search for life outside Earth often focuses on water. Previous research found that a universe where the weak force is entirely absent could still be habitable. In the new study, the researchers examined scenarios where the weak force was still present but weaker than in our universe, as well as cases where it was stronger. In universes with a stronger weak force, neutrons would decay more rapidly, so the early universe in that scenario would be nearly devoid of helium, the researchers said. This is fine when it comes to levels of water in the universe, because water consists of hydrogen and oxygen. In universes with a weaker weak force, neutrons would decay more slowly, leading to more helium. For any hydrogen to survive without getting incorporated into larger atomic nuclei, the scientists found a different fundamental constant would have to be smaller. In other words, the ratio of baryons, which include protons and neutrons, to photons, which light is made of, would have to shrink. The weak force also plays a role in how stars fuse hydrogen into helium atoms, which can influence how bright, hot, large and long-lived stars are. Moreover, the weak force controls how often neutrinos interact with regular matter, which in turn has an effect on how energy drains from the interiors of stars. Universes with a weaker weak force would have stars with more deuterium, which is a hydrogen atom with an extra neutron within its nucleus. Deuterium-rich stars would be larger, brighter, and redder than equivalent stars in our universe, resembling thered giant stars of our cosmos. Universes with a stronger weak force would have stars with more helium-3, which is a helium atom missing a neutron from its nucleus. These stars would be slightly brighter and larger in diameter than equivalent stars in our universe and would have modestly shorter lifetimes, although they would have similar temperatures. Although stars in these universes are somewhat different from ours, their comparable surface temperatures, luminosities, diameters and lifetimes mean these universes would remain potentially habitable over a wide range of strengths for the weak force, according to the researchers. "The most surprising thing for me was that in most possible universes, stars still work one way or another," Howe said. "In many possible universes, stars would even have more complex life cycles than in ours or could be more favorable to life." All in all, "in my opinion, the most important implication is that there are many different ways a universe could work and still support life, not just the physics of our own," Howe said. Future research can examine universes with different strengths of the strong nuclear force, the strongest known force between particles, which binds protons together in atomic nuclei, despite their mutual repulsion, Howe said. The scientists detailed their findings online Sept. 13 in a study accepted by the journal Physical Review D.